Departure from Primošten is in the morning. We sail close to the fortress “St. Nicholas,” which is located on the front of Šibenik (UNESCO town), and enter the estuary of the river Krka. There we sail upstream to the center of the National Park Krka, Skradinski Buk, the largest and most beautiful waterfalls on the river Krka. 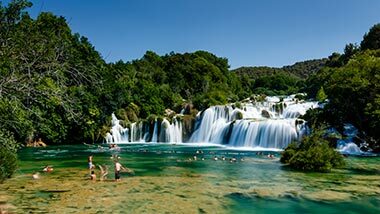 Upon arrival to the National Park, guests can use 3 hours of free time which can be used for swimming under waterfalls, sightseeing Krka independently or with a guide, and for various other activities that Krka provides to its visitors. We are going back in town of Primošten in the late afternoon. Price for one person is 400,00 kn. The price includes a ticket for N.P. Krka, lunch and a nonalcoholic drink. Feel free to send us inquiry, if possible we arrange trip or activity for You!